A collection of Valentine's gifts I have procured or produced. 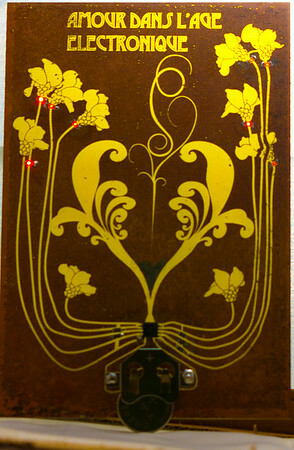 Amour dans l'age electronique Based on the Surface Mount Soldering Badge kit sold by Applied Platonics, this Valentine's card was designed in Adobe Illustrator, then etched by toner transfer onto a copper-plated board, and finally soldered in place with reflowing soldering paste and finally touched up with a soldering iron. 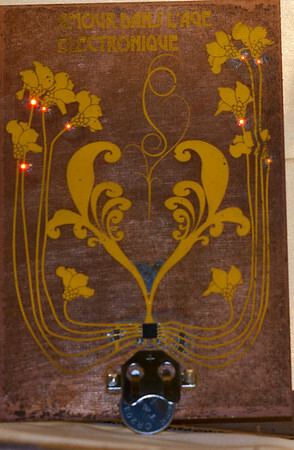 Since the board itself is translucent, the final card will have the design shine through if mounted with a backlight. 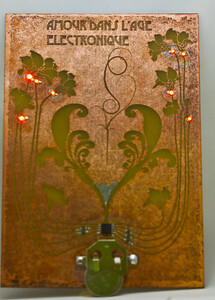 Amour dans l'age electronique Based on the Surface Mount Soldering Badge kit sold by Applied Platonics, this Valentine's card was designed in Adobe Illustrator, then etched by toner transfer onto a copper-plated board, and finally soldered in place with reflowing soldering paste and finally touched up with a soldering iron.